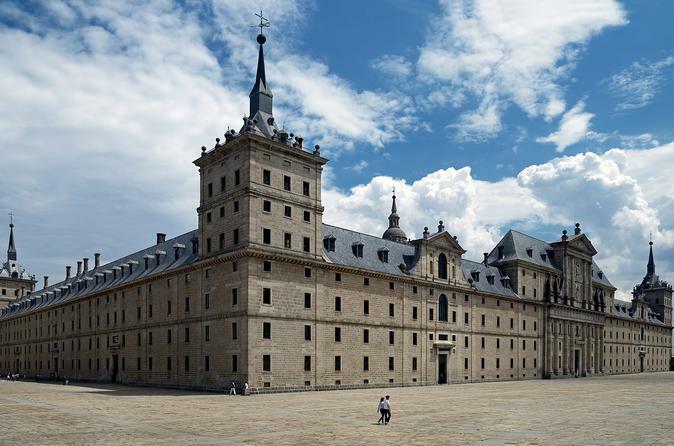 This is the most exclusive excursion from Madrid to El Escorial by VIP Class luxury bus and accompanying guide to visit El Escorial and its imposing Royal Monastery declared a World Heritage Site by Unesco, as well as the monumental site of the Valley of the Fallen located a few kilometres away, in another beautiful enclave of the Sierra Madrileña. After the guided tour to El Escorial we will have a free time to have a lunch before continuing the route to the nearby Valle de Cuelgamuros where the highest Christian cross in the world (150 meters) announces the location of the Valley of the Fallen, an extraordinary and controversial architectural work erected in honor of the fallen in the Civil War that gave way to a long period of dictatorship in Spain. We will visit the interior of the basilica carved into the rock and will admire the grandeur of the monumental complex its singular beauty in terms of architecture and landscapes.